Yes, this is a reissue of the Chandos recording originally released in 1998 as CHAN8788(2). It comes as a two-for-the-price-of-one release in a series of reissues of recordings Richard Hickox made for Chandos. There were more than 280 in all. Hickox died in November 2008 and this reissue takes its place in the line of discs specially re-packaged by Chandos in tribute to this conductor's huge contribution to the label. This review of Elgar’s oratorio The Kingdom will compare the Hickox reading with that of Sir Adrian Boult made in December 1968 in the Kingsway Hall, London (EMI CMS 7 64209 2). It was made to celebrate Sir Adrian’s 80th birthday. It featured Margaret Price as the Blessed Virgin, Yvonne Minton as Mary Magdalene, Alexander Young as St John and John Shirley-Quirk as St Peter with the London Philharmonic Choir and Orchestra. Sir Adrian admired The Kingdom greatly and valued it even more than The Dream of Gerontius. Elgar had in mind a trilogy based on the life and work of Christ’s Apostles. The first of this trilogy, The Apostles, was premiered in October 1903. The Kingdom followed in October 1906. Elgar never completed the trilogy which was intended to close with The Last Judgement. Interestingly, in 1926, Elgar told Vaughan Williams that he was glad that he had not written this third oratorio because Vaughan Williams had done it for him in his Sancta Civitas. Compared to The Kingdom, The Apostles - also recorded by Hickox and reissued by Chandos - was more dramatic with a most unusual, sympathetic treatment for the character of Judas. The Kingdom is more introspective but with high drama and excitement centred around the Pentecost scene when the Apostles are filled with the Holy Spirit and are enabled to spread ‘the wonderful works of God’ in ‘many tongues’. I shall take three comparative examples. Boult’s Prelude spans 7:46 whereas Hickox spreads himself over 9:02. At once one appreciates the great respect, reverence and affection Boult has for this work in his noble and affecting Prelude especially for that lovely theme that underscores Peter’s Pentecost speech ‘It shall come to pass in the last days …’ Hickox on the other hand is more reserved at this point, showing much reverence for the surrounding Kingdom themes. This alternative approach works well and Hickox is served with marvellous Chandos sound revealing so much more detail and with imposing spread and depth. The Pentecost scene is impressive in both recordings with Hickox creating much excitement in the section where the disciples are baptised with fire. The chorus is consistently right on the mark here and very much so throughout. Boult’s forces are no less thrilling in this inspired scene but the older sound does not focus the choir nearly as well. Both Alexander Young as St John and especially John Shirley-Quirk as St Peter are outstanding here. Shirley-Quirk’s rendering of the wonderful speech I have already alluded to in my remarks about the Prelude never fails to bring a lump to my throat at the words: ‘… I will pour forth of My Spirit upon all flesh: and your sons and your daughters shall prophesy, and your young men shall see visions, and your old men shall dream dreams …’ David Wilson-Johnson, good as he is, cannot match this depth of emotion and commitment. Finally to that moving aria in part 2, ‘The Sun Goeth Down’. The opening violin solo in both recordings is beautifully realised but the Boult violinist is more affecting. It has to be said too that Margaret Price’s rendering is much more uplifting and sensitive than Margaret Marshall’s rather cooler approach on Chandos. 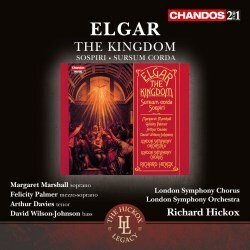 The EMI box set also includes an excellent recording (for me the best on record) of Elgar’s Coronation Ode conducted by Philip Ledger whereas the Hickox set just includes the short items Sospiri and Sursum Corda both very well delivered, I should add. For me the Boult version of The Kingdom still remains my top recommendation.